The film opens with voiceover by Giles (Richard Jenkins) who tells his story that turns into a beautiful poem at the end of the film. It braces the audience for sappiness, but as the film unfolds, Del Toro shows how sappiness can be done in movies in a good way – with the repeated use of the famous Alice Faye song, “You’ll Never Know”. The film’s subject is Elisa Esposito (Sally Hawkins), a mousy, curious woman rendered mute by an injury she sustained as an infant. She works the night shift as a janitor at the Occam Aerospace Research Centre in early 1960s Baltimore. 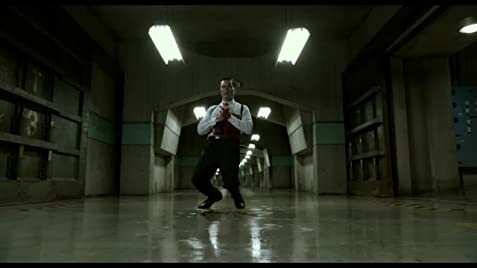 One day, the facility receives a new “asset” discovered by the cruel and abusive Colonel Richard Strickland (Michael Shannon) in the rivers of South America. Elisa has a brief encounter with The Asset (Doug Jones), which she discovers is an amphibious humanoid. She feels sorry for it and helps it escape by stealing it from the facility. Helping her are her best friend Giles, one of the centre’s scientists, Robert Hoffstetler (Michael Stuhlbarg), who is actually a Soviet spy named Dmitri and her co-worker (Octavia Spencer). The film’s best and most amusing is the TV (one of many) clip of MR. ED (the talking horse) in which after a newspaper article seen in the background of a monkey sent to space. Mr Ed Says, “I guess I have to enlist.” It is a very funny and appropriate segment as the setting is of the time when Russia and the U.S. were engaged in the space race, just as it is mentioned that the U.S. wanted to send the water creature into space because of its breathing capabilities. Any perfect story has to be brought to the screen by a perfect performance. This performance belongs to Oscar nominee Sally Hawkins, who broke into the film scene with the remarkable portrayal of Mike Leigh’s heroine in HAPPY-GO-LUCKY. She brings heart to the role as a deaf mute who finally finds not only love but a purpose for living. Del Toro is smart enough to prime the audience for what is to come, thus invoking what was Hitchcock’s best tool – audience anticipation. The audience first sees blood on the sink after Elisa touches the creature. The film contains lots of the back humour one expects of Del Toro. The poster “Loose lips might sink ships” is shown on the wall of Elisa’s (who is mute) locker. “No negativity” Strickland utters, just as he realizes he is about to lose everything he has worked for. The musical fantasy sequence towards the end in back and white where the mute Elisa is then allowed to sing is nothing short of inspired filmmaking. 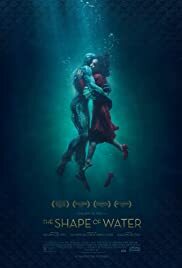 THE SHAPE OF WATER is filmmaking at its best with Del Toro still in top form, with top talent on display. He does not compromise on the violence (a few torture scenes involve the metal prod) but amidst the violence and occasional foul language, his latest film is one of the most credible and beautiful romantic stories in cinemas this year. THE SHACK is a faith movie that loses the ‘Christianity’ label but whose theme would probably include the Christian faith. God appears in many forms, as male papa (Graham Greene), female papa (Octavia Spencer) or Jesus (Avivi Alush) or Sarayu Sumire Matsubara. Though the Christian God’s name is absent, many of the teachings of Christ are present in one form or another. In the film, God appears in the film as a trinity, though the trinity is not in the form of God, the Father, the Son and the Holy Ghost but in the form of papa, Jesus and Sarayu. The preaching of forgiveness, very important in Christianity is also emphasized in the story. The film opens with a young boy, MacKenzie as he witnesses his father abusing his mother and then giving him a beating after he tells on him at church. The abuse obviously flows into the boy’s adult life. The film forwards to the present where the boy is now a grown man, (Sam Worthington), married with two children. Christianity loves to test the faith of its believers and in this case, the patience of the audience as well. After his young daughter is murdered during a family camping trip, Mack Phillips spirals into a deep depression causing him to question his innermost beliefs. Facing a crisis of faith, he receives a mysterious letter urging him to the shack where the crime occurred, deep in the Oregon wilderness. Despite his doubts, Mack goes there and encounters an enigmatic trio of strangers led by a woman named Papa. Through this meeting, Mack finds important truths that will transform his understanding of his tragedy and change his life forever. Director Hazeldine’s straight forward storytelling technique leaves nothing to the imagination. Apart from a few dreamlike sequences, the story unfolds in chronological fashion with hardly a flashback The film is more interesting (though this is not saying much) in the first 15 minutes or so, because there are incidents happening. After, when redemption is the order of the day, the film just ponders along ponderously. There are no special performances in the film. Worthington appears to be faith blindly walking though his role The same goes for the rather well-known name cast that includes Radha Mitchell, Octavia Spencer and Graham Greene. I have never seen Spencer in such a painful performance, forcing laughter too many times as in this film. The film is suitable for a family audience. There is no foul language. Even the child beating scene is done without any violence and the reason for Missy’s appearance is mentioned in a ‘too polite’ manner. An overlong faith movie running at 132 minutes which is as slow and tedious as it tests your faith and patience, see THE SHACK only if you absolutely MUST. The film end with an equal tedious song “Keep Your Eyes on Me” by Faith Hill and actor Tim McGraw.